Current theories consider the earth to have formed from condensation of dust and gas in space. Gravitational and radiochemical heating melted the aggregated solids, and as the planet cooled, partial solidification and separation of materials took place. The present structure of the earth consists of a largely molten core composed chiefly of iron and nickel, surrounded by lighter rocks. The outer few miles, the crust, is the only portion of the earth that is accessible, and is the source of most of the substances used in a technological society. The crust has undergone a complex evolution as processes such as weathering and erosion have broken up the original rocks, and sedimentation and crystallization have produced new ones. High pressures and temperatures and volcanic activity have produced other changes. Indeed, these processes continue. 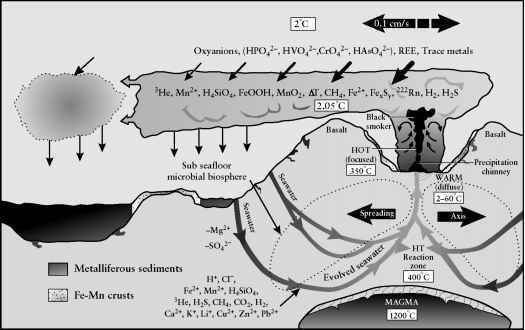 These reactions, which fall into the realm of geology and geochemistry, are too extensive to be dealt with in detail here. We will discuss some of the aspects that most strongly impinge on human activity, in particular, those relating to some of the substances that we use extensively. Many terms describing rocks and minerals are encountered in any discussion of the earth's crust and the processes that take place in it. The terms may describe a specific mineral, categorized by a specific structure and general composition [e.g., beryl, Be2Al2(Si0s)g] a class of related minerals (e. g., feldspars), or a conglomerate with particular properties (e.g., granite). Table 12-1 gives some of the most common of these terms; it is far from complete. rocks. The approximate formula is MSi03, but the actual Si/O ratio is 4:11. One crystalline form of CaC03. much of the ocean basins. 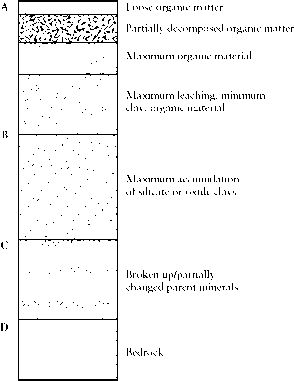 used to refer to any mineral of particle size under 2 |j,m. fibrous (asbestiform) version of the mineral riebeckite. A serpentine (see below) asbestos, Mg3Si205(0H)4. A mineral group that is the most abundant in the earth's crust. Feldspars are the major constituents of igneous rocks and also important in most sedimentary and metamorphic rocks. The general composition is KAlSi308, but Na often substitutes for K, or another Al substitutes for a Si with the charge balance maintained by substitution of Ca or Ba for some or all of the alkali metal. A common igneous rock formed on slow cooling; it is mostly quartz and feldspar. Rock formed on cooling of magma, the molten rock released from below the earth's surface by volcanic action. It consists of tightly interlocked crystallites of a variety of specific minerals. A common clay mineral, Al4Si40io(0H)8. A sedimentary rock, usually deposited through biological processes, and mostly calcium carbonate. Fe304; a combination of Fe(II) and Fe(III). It is an example of a spinel (a class of minerals based on the composition M(II)M'(III)204. A rock that has undergone change under high temperature and pressure, aided by chemical action (e.g., of water). A group of aluminosilicate minerals with a sheetlike structure. Micas contain potassium and hydrogen, and often other elements. An example is muscovite. A common feldspar, KSi3 08 (the same formula as orthoclase but a different crystal structure). A group of abundant minerals in igneous rocks, with compositions running continuously from Mg2Si04 (forsterite) to Fe2Si04 (fayalite) and containing also Ca, Mg, and Mn as common bivalent cations. A common feldspar, KSi3 08 (the same formula as microcline, but a different crystal structure). The mineral FeS2 (fool's gold), which contains the S2~ ion. The term pyrite is sometimes used for related metal disulfides. A group of silicate minerals found in igneous and some metamorphic rocks. Their compositions are MSi03. An example is diopside, CaMgSi20g. Crystalline Si02. Rocks composed mostly of quartz are called quartzite. A sedimentary rock composed of sand, mostly quartz but sometimes particles of feldspar or other minerals, cemented together with calcium carbonate, silica, an iron oxide, or a claylike mineral. The properties depend very much on the cementing material. Rock formed from sediment deposits of material derived from the disintegration of another rock. A sedimentary rock formed from mud, silt, or clay. Rock formed by the metamorphosis of shale. Aluminosilicate minerals with molecular-sized pores that can adsorb small molecules. Many synthetic zeolites have been made because of their adsorption and catalytic powers. Also used as "builders" in detergents in place of phosphates. Table 12-2 gives the relative abundances of the most common elements in the earth's crust. As can be seen, by far the largest part of the crust is made up of silicon and oxygen, which form the basis of the abundant silicate minerals. The fundamental structure of all silicates consists of four oxygen atoms tetrahedrally arranged around a central silicon atom. In terms of oxidation numbers, these are considered to be Si(+4) and 0(-2) (oxidation states Si(IV) and O(-II)), but the Si—O bonding is covalent. However, an isolated Si04 tetrahedron would carry a charge of -4. Minerals based on the simple SiO^ ion in association with cations (salts of silicic acid, Section 11.2) are unusual, and more typically the natural silicates are based on rings, sheets, and chains of linked tetrahedra in which the Si atoms share oxygens. The 0:Si ratio is less than 4. Some typical structures are given in Figure 12-1. In aluminosilicates, aluminum, the third most abundant element in the earth's crust, is also present, surrounded tetrahedrally or octahedrally by oxygen atoms. From Table 12-2 it is seen that many of the elements essential for modern technology are present in very small amounts in the earth's crust compared with the dozen most abundant elements. The total amounts of these less abundant elements in the earth's crust are vast, however, and they are widely distributed. Most common rocks contain a few parts per million of many elements distributed randomly by isomorphous substitution of abundant elements (e.g., Pb replaces some K, and Zn replaces some Mg in most common rocks). For this reason, it has been suggested that humanity will never really run out of mineral resources, and as high-concentration ores are exhausted, new technology can be developed to tap the sources in the common rocks. However, the volume of material to be mined and processed, the energy requirements, and the waste disposal problems clearly set economic and environmental restrictions on the minimum concentrations that can be employed for large-scale use of any substance. Generally, society uses atypical, high-concentration sources for most of its mineral needs; little if any technological development would have been possible in the past if all elements were uniformly distributed in the earth's crust. FIGURE 12-1 Examples of silicate structural units: (a) the SiÛ4 tetrahedron; (b) a schematic view of a SiÛ4 tetrahedron, where each apex represents an oxygen; (c) linked tetrahedra, the Si20y~ ion; (d) a chain structure; (e) a cyclic silicate structure; (f) a double chain; and (g) a two-dimensional layered structure. Minerals used as sources from which desired elements can be isolated are called ores. The ores of many elements are made up from particular compounds of the element in question, although these may be mixed with much inert rock. High-grade ores typically consist of veins of the compound; in low-grade ores the particles may be widely distributed in the rock. Mining may involve tunneling along the ore veins or open pit quarrying of large volumes of rock. The latter is particularly necessary when low-grade ores are used, as is becoming more common, and as modern earthmoving equipment makes this technique economical. Placer mining which involves recovery from riverbed gravels, is important in gold mining. 0re bodies in nature were formed in a number of ways: for example, by selective crystallization as the molten material (magma) cooled to form rocks, and by hydrothermal processes, which have been important for many widely used metals. In a hydrothermal process, water or brine at high temperature and pressure dissolves metal ions from the bulk rock and redeposits them in concentrated form elsewhere. The extraction process is analogous to a weathering reaction. Exploitable deposits typically formed where the liquid flowed through a restricted channel in which a precipitation reaction could take place. 2The Superfund program is a federal plan for funding the costs of cleanup of seriously polluted waste disposal and other sites. enough to have retained a high mineral content, rapid mixing with the cold seawater results in formation of an immediate precipitate that contains materials such as FeS, ZnS, CuFeS2, CaS04, and BaS04 (the minerals pyrrhotite, sphalerite, chalcopyrite, anhydrate, and barite, respectively). Since many of theses are black, the cloud of precipitating minerals around the release point gets the name black smoker; generally this cloud is accompanied by buildup of a "chimney'' of precipitated minerals. The process is shown schematically in Figure 12-2. These systems are important not only for their inorganic chemistry, but also for the unusual biological activity that they support, based on the use of reduced mineral compounds as energy sources by certain bacteria that are capable of thriving under high-temperature conditions and of utilizing the energy released in biological oxidation of the reduced species to support their metabolism. These life-forms make up a class of organisms that are not dependent on solar radiation for their ultimate energy source. Some specific ores and treatments used for individual metals are listed in Table 12-3. Purification with aqueous Na0H to give Al203 followed by electrolysis in molten cryolite, Na3AlFg. Volatilized from crude Zn and collected in flue dust, or precipitated from Zn solutions. Separated from Zn by distillation or electrolysis. Reduction of ore with C produces ferrochrome alloy. This is dissolved in H2S04, and Cr is then obtained by electrolysis. Alternatively, Cr203 can be formed and reduced with Al, C, or Si. 0re roasted to oxide (see Section 12.2.2.2). May be reduced to a mixture of metals, dissolved in H2S04, other metals separated, and Co obtained by electrolysis or by precipitation as Co(0H)3 with Na0Cl; heating to oxide followed by reduction by C or H2 gives Co. Waste sludge of silicates and Fe2Û3. Requires abundant electrical energy. Release of fluoride compounds. A by-product of Zn production. Usually a by-product of the production of other metals (e.g., Cu, Pb, Ni). Much S02 released in the smelting process, along with As and Sb oxides; both gas and dust discharges involved. Also aqueous waste from the refining process. Anodic sludge is a source of Ag and Au. It also contains Se, Te, and heavy metals. Crude Cu anode refined electrolytically; crude Cu anode dissolves in H2SO4 —CuS04 electrolyte and deposits as pure Cu cathode. distilled Hg may not be condensed. by distillation of the Hg. making involve oxidation of C, Si, S, and P with O2 and removal as CO2 and as a slag formed with the limestone flux (see Section 12.2.2.2). As and Sb are often present and are released as oxides. 0xides (e.g., pyrolusite, Mn02) and some carbonates and silicates. Ferromanganese (~ 80% Mn) produced in a process similar to that used for Fe; pure metal is produced electrolytically from Mn02 dissolved in sulfate solution. Usually occurs with Fe and Cu. For all metals, it would seem economically preferable to recycle used metal, since this would eliminate the concentration and reduction steps necessary for virgin materials. Unfortunately, collection and sorting are also energy-intensive processes. 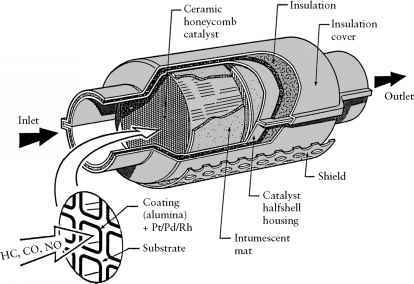 Moreover, under cheap energy conditions, many processes have been developed without recycling as a major objective. No reprocessing can tolerate the presence of components (metallic or otherwise) that the refining steps are not designed to remove and that can produce deleterious properties in the final product. Thus, sorting and separation may have to be extensive. However, as waste disposal becomes more difficult, recycling must be increased for economic reasons as well as for conservation ones. Recycling is discussed further in Chapter 16. The recovery of a metal from its ore, smelting, has historically been another major source of pollution. Sulfur oxides from sulfide ores have been a major emission, but dusts containing toxic elements such as selenium and heavy metals also have been of concern. Modern smelters can eliminate most of these problems. The details of the metal recovery process depend on the metal and often on the exact composition of the ore used. However, some steps employed are common enough to be discussed in general terms. which are surfactants analogous to detergents (Chapter 7), with an affinity for the metal sulfide particle. 0ther concentration methods involve, for example, density differences and magnetic separations. In an alternate approach, the metals may be extracted in solution from the crushed rock by chemical or bacterial action (Section 12.2.1). A common chemical treatment uses cyanide, usually as NaCN, and is discussed in connection with gold mining in Section 12.2.6, although it is also used in silver mining and in the recovery of some common metals. Both the bacterial and chemical processes produce large pools of solution that are often acidic, with a high metal content. An example of the considerable potential for environmental damage if the containment fails is the release of several million gallons of acidic, metal-rich sludge and water into the Guadiamar River and surrounding areas in Spain in 1998 after a holding dam at a mining site failed. 0ther releases are referred to in Section 12.2.6. Even exposure of waste rock to air, water, and bacterial action may allow the release of residual heavy metals in soluble forms, which can enter water systems. Sulfide and arsenide ores, and some others, are heated with air at high temperature to convert them to oxides. This process may also involve the use of limestone or some other flux3 that will permit removal of silicate materials, which react with the flux to form a molten slag. The slag can then be separated from the desired material that is insoluble in it. With sulfide ores, S02 is a major gaseous product and must be trapped to avoid air pollution problems, as discussed in Section 10.4. Arsenic oxide, As203, is another common product that volatilizes from the furnace but can be condensed to a solid at room temperature. Particulate materials are also given off to the atmosphere unless trapped or precipitated. Possible water pollution problems come from water used to scrub exhaust gases and to cool slag, and from aqueous treatment of the oxides in some processes. The oxides produced as just described, or oxide ores, must be reduced to the elemental metal. Carbon, as metallurgical coke made from low sulfur coal, is a common reducing agent. This reduction is carried out at high temperature, such as in blast furnaces, and offers the same waste control problems already mentioned. Large volumes of very hot gases are involved. 0ther reduction procedures are in use for some elements; electrochemical reduction of alumina is an obvious example. Some examples of these processes are described shortly. 3A flux is a material that will combine with some of the reaction products to form an easily melted phase, called a slag. electrolytically and plated out in pure form on the cathode of an electrochemical cell. Many ores are used as sources for several elements, so that actual flow schemes for metal recovery may be elaborate. In addition, unwanted elements are usually present, and if these include toxic materials (Chapter 10), considerable care must be taken in waste disposal practices. Many metal smelters and refineries in the past were noted for their air and water pollution. The discussion of acid mine drainage (Section 10.6.3) alluded to the ability of bacteria to use metal sulfides in their metabolism, and this capacity is the basis of applications of bacterial attack on sulfide ores to liberate the metals in a useful form. Such processes, which can be referred to as microbial mining,4 permit recovery of metals from low-grade sources in an economical way. The most common bacterium involved in these processes is Thiobacillus ferroox-idans, which occurs naturally in some sulfide minerals. By oxidizing the sulfide to obtain energy, the microbe produces sulfate and releases the metal as soluble metal sulfate. In the copper recovery process, low-grade ore is simply treated with sulfuric acid to encourage growth of the acidophile bacteria, and the dilute copper sulfate solution leaching from the ore pile is collected in a catch basin. The copper can then be recovered by electrolysis and the acidic solution recycled. The normal high-temperature oxidation, with release of gaseous SO2 and related air pollution or scrubbing problems, are thus avoided. About 25% of current worldwide copper production is based on this process. Commercial gold mining is also beginning to apply this method to release gold from low grade sulfide mineral deposits so that it can be recovered by cyanide extraction. Even nonmetallic resources are being extracted in this way. A different bacterium is capable of solubilizing phosphate from its ores, thereby avoiding the usual sulfuric acid treatment and the production of large amounts of calcium sulfate by-product. Bacteria commonly used in these processes have several limitations, such as sensitivity to poisoning by heavy metals and inability to function at the elevated temperatures that the biooxidation process can sometimes produce. Some strains are protected from heavy metals by special enzymes, however, and proper selection or genetic engineering of new strains may avoid this problem. Use of thermophilic bacteria from hot springs and deep sea vents shows promise of permitting higher temperature operation. but excess sulfide is undesirable; hence the requirement that the coke be made from low-sulfur coal. Some silica is reduced to Si, and phosphate to P. The product of the blast furnace, pig iron, ordinarily contains about 2% P, 2.5% Si, more than 0.1% S, 4% C, and 2.5% Mn by weight. The latter element is present in the iron ore and goes through reactions similar to those of Fe. Purification to give a steel of improved physical properties is necessary for most purposes. In particular, P, S, Si, and C must be removed or reduced in amount. In the now obsolete open hearth method, the pig iron with perhaps 40% scrap iron, limestone flux, and some Fe203 and Fe304 is melted in a furnace heated by gas and air. The P, C, Si, and S are oxidized, and the silicate and phosphate are removed as a slag by reaction with basic Ca0. Modern procedures use the basic oxygen process, in which the oxidation is carried out by a stream of oxygen gas. The process requires much less time (the order of half an hour compared with 12 h) and less energy than the open hearth process, but it uses less scrap than the latter and has had some depressive effects on recycling of scrap iron and steels. Special steels, especially those requiring oxidizable components, are made in an electric furnace. This is expensive in terms of energy, but provided the overall composition is suitable for the steel being produced, a high proportion of scrap can be used. The waste liquors are highly acidic and contain ferrous salts; discharge to a water system is reminiscent of acid mine drainage (Section 10.6.3). Injection into deep wells is one means of disposal, although this could be dangerous with respect to groundwater contamination. This requires less energy than electrolysis with inert electrodes to produce Al and 02 because of the smaller free energy change involved in the overall process. It is still an extremely energy-intensive process because of the strong Al—0 bond energy that must be overcome. The electrolysis process produces some fluoride and other particulate emissions that must be trapped to avoid air pollution problems, but the most abundant waste products of aluminum mining are the insoluble materials from the Na0H treatment, the so-called red mud tailings, and, of course, any waste from the generation of the electricity employed. However, most of the electricity used for aluminum smelters is generated from water power for economic reasons. Perfluorocarbons (e.g., CF4) are produced when the Al content of the electrolysis bath is too low to maintain the reaction, and the voltage rises to cause secondary reactions to take place between the fluoride and the electrode material. It has been estimated that 30,000 metric tons of carbon tetrafluoride and 3000 tons of hexafluoroethane are released annually by worldwide Al metal production.5 These are inert, nontoxic materials, but they have significant potential as greenhouse gases (Chapter 3). Because they are resistant to even the highly reactive atoms and free radicals of the upper atmosphere, breakdown is very slow (resulting mostly from photolysis by very short wave-length UV radiation). It is estimated that the lifetime of CF4 in the atmosphere is as long as 50,000 years (Table 5-1). The recovery of gold has some particular environmental consequences. Gold is usually found in the form of the free metal, but only rarely in the large nuggets of Gold Rush legend. Rather, the gold is in fine particles, often very intimately mixed with worthless rock. Because of gold's high density, it can be recovered in some cases by physical separation such as placer mining of river gravels, where weathering processes have released the metal from its original matrix. Such processes on a large scale have major physical consequences because the water system is disturbed through dredging and waste gravel deposition. However, the desire to use less tractable sources, and especially low-grade ores that can be profitable because of the high value of the metal, has resulted in reliance on some chemical processes that can have more serious environmental consequences. 0ne such process involves the dissolution of the metallic gold in mercury metal, in which it has high solubility. The liquid mercury solution (amalgam) is then easily separated from the debris, and the gold can be recovered by distilling the mercury away. This is a simple technology that can be used in relatively primitive mining operations: for example, the gold mines of the Amazon Basin of Brazil. Unfortunately, when carried out with simple technology, the mercury tends to be condensed relatively inefficiently, and there are losses to the environment both as the vapor and the liquid, with consequences that were discussed in Section 10.6.7.
can be slowly oxidized by air to the soluble K2Au(CN)4, which can be leached from the rock and concentrated for gold recovery (see Table 12-3). This process employs large volumes of rock and large amounts of cyanide, with considerable risk of release of toxic cyanide to local water systems. This risk has been realized several times. In late 1999, cyanide from a holding pond at a gold extraction operation in Romania was released into the Tisza River when a dike failed. This river carried the contamination into Hungary and into the Danube. Massive kills to fish and other fauna resulted. Six weeks later a dam broke at a similar installation in a tributary upstream of the original release. Pollution involves not only the highly toxic cyanide ion, which is fairly rapidly oxidized to less toxic cyanate, CN0~, but also heavy metals, in this case especially copper and zinc, which will remain in the river sediments for a much longer time. This spill is just the latest of several similar examples; 3 x 106 m3 of solution spilled into the Essequibo River in Guyana in 1995, and 2000 kg of KCN spilled into the Barskoon River in Kyrgyzstan in a 1998 mining truck accident. Cyanide wastes have contaminated several areas in the western United States. Surface rocks are subject to breakup and chemical change by a variety of processes called weathering. Some of these processes are listed briefly. Physical disintegration of rocks caused by temperature effects, frost, wind, water, and ice erosion. Some of these factors are also responsible for transporting the weathering products away from their original sources. The small particles produced have a large surface area that facilitates other weathering processes. Chemical reactions with water (e.g., hydration or hydrolysis). Hydration is illustrated by reaction (12-10); the change in crystal structure as water molecules are gained or lost will result in disintegration of the material. Hydrolysis involves a more extensive change in the material as shown, for example, in reaction (12-11). Reactions of this sort can liberate cations from the rocks [e.g., K+ in (12-11)]. Attack by acid, especially carbonic acid. Reactions (12-12) and (12-13) are examples of the weathering interactions of acid with minerals. Reaction (1211) could also have been written as an example of acid attack. Biological effects. These may take the form of physical disruption by plant roots, chemical effects from substances excreted from roots, and bacterial action. For example, the reactions in the nitrogen cycle and the organic materials produced by biological action can determine the soil pH and consequently solubilities and leaching on a local level. The weathering products that result from these various processes depend on the composition of the initial rock and the conditions. Rocks with high silica contents, that is, with more Si—0 bonds, tend to have the greatest chemical stability simply because of the large Si—0 bond energy, and igneous rocks (those produced from molten material), formed under the most extreme conditions of temperature and pressure, are most reactive to weathering decomposition. Igneous silicates high in magnesium and iron (e.g., olivines) produce soluble Mg2+ and Si04" and insoluble Fe0(0H) under the action of H20 and C02, while feldspars with magnesium, calcium, and aluminum contents give soluble Na+,Ca2+, and Si04", and kaolinite as the insoluble products. However, at nearly neutral conditions (pH J-8), further dissolution of the silicate component can take place, leading to a residue of Al203 • 3H20, while under more acidic conditions, solid Si02 is left with soluble Al3+ species. This last process is of concern as a result of acid rain in view of the toxicity of Al3+ toward plants (Section 10.6.9). Weathering patterns vary with climate zones. For example, in wet temperate forest regions, decay of organic material produces acidic leaching conditions, so that the upper levels are depleted in FeO(OH) and some alumina, while material with a high silica content is left behind. In tropical rain forest conditions, where temperature and moisture conditions lead to faster decay, conditions are less acidic, and leaching removes more of the silica components, leaving FeO(OH) and alumina clays. This is shown schematically in Figure 12-3. 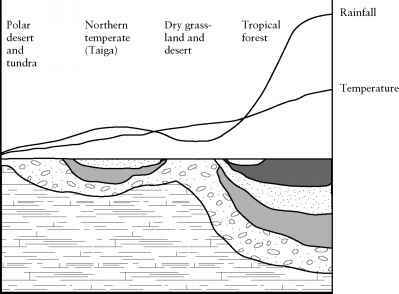 FIGURE 12-3 Weathering products from polar (left) to equatorial (right) regions, showing dependence on temperature and rainfall. Based on P. W. Birkeland, Soils and Geomorphology, 0xford University Press, New York, 1984. The eventual result of the breakup and composition changes of weathering reactions is the formation of soil; this, of course, is the fraction of the earth's surface utilized for plant growth. Soil may be regarded as the upper layer of the regolith, which is the weathered and broken-up material overlying bedrock. Soil is the most heavily weathered portion of the regolith and is normally significantly influenced by plant materials. Soils play an important role in environmental chemistry besides providing a site for plant growth. Much of this role depends on the microorganisms that are important soil components. The absorption of C0 has already been referred to, as have the carbonate equilibria (Section 9.2.2), which in soils are strongly dependent on C02 generated from bacterial degradation of organic materials. 0ther processes include rapid S02 absorption; soils have been shown to be effective in removing S02 from the air. Buffering of pH, and of metal ion concentrations, are also important aspects of soil chemistry. A typical soil contains stones and gravel, coarse and medium-sized material such as sand and silt composed of silica and other primary minerals, and finer weathered material classed as clays. Most soils contain a few percent organic components such as humic substances (Section 9.5.7) and undecomposed plant materials, although a few organic soils (peats, mucks) may contain up to 95% organic matter. Typical soils exhibit several layers (horizons) of somewhat different composition that are important in soil classification. These horizons are the result of biological decay, weathering, and leaching processes. An idealized version is shown in Figure 12-4. Soils play a significant role in the carbon cycle (Section 10.2), with about 60 billion tons of C02 released annually from soils. About the same amount is bound into land plants. Much of the C02 release comes from decomposing plant litter in the upper layer, but about two-thirds is released at deeper layers, from respiration in roots, fungi, and soil microorganisms. Carbon dioxide partial pressure in soils can be high. Factors that enhance microbial activity, which converts organic matter to C02, influence the amount of organic matter a particular soil will retain. Thus, temperate regions with cold winters allow a significant buildup of organic constituents, while tropical regions with year-round warmth promote microbial decay and often produce soils with little organic material below the upper layer of debris. FIGURE 12-4 An idealized soil profile: A, B, C, and D are typical horizons (sometimes designated by other letters); they may be further subdivided, Ai,A2, etc. An initial "O" horizon is often indicated. determines the stickiness of the soil and its agricultural workability. The clays also are largely responsible for the very important ion exchange properties of soils, although humic materials contribute significantly. Typical clays are aluminosilicates, present largely as colloidal particles; that is, the size is less than a micrometer. The particles are composed of layers or sheets somewhat analogous to the structure of graphite. The surface area of such small particles is very large and, in addition, internal area between the layers may be available to bind other materials. Thus, surface properties and adsorption are quite important. A variety of clays is recognized; two that are common components of soils are kaolinite and montmorillonite, the formulas for which are (idealized and simplified) Al2Si205(0H)4 and NaMgAl5Sii2O30(0H)g «H20, respectively. The structure of aluminosilicate clays is based on tetrahedral Si04 units, each of which shares three of its oxygens with other tetrahedra to produce a planar sheet. If this layer is taken as infinite, the stoichiometry is Si20j". Associated with this is a layer of octahedral Al06 units that share the apicial oxygens from the Si04 units in the tetrahedral layer. The octahedral unit can be written Al0n(0H)m, where n oxygens are shared with Si, and m 0H" groups bridge the aluminum atoms. Kaolinite (Figure 12-J) has an equal number of Si and Al atoms, and the combined layers are neutral. This combined layer is bound to others in the crystal by hydrogen bonds. In pyrophyl-lite, AlSi20J(0H), a second layer of Si04 tetrahedra is bound by sharing of the corner oxygens to the other side of the octahedral aluminum layer, giving a sandwich-type structure. These layers are held to others in the solid by van der Waals attractions. In both types of clay the layers are comparatively easily separated. If some of the trivalent aluminum atoms are missing or replaced by bivalent ions such as Mg2+ orFe2+, the charge balance is no longer maintained. The layers carry a net negative charge, which is balanced by other cations between the layers. These additional cations also serve to hold the layers together by Coulombic attraction. In some layered structures, the interlayer cations, which may be Na+,K+, or Ca2+, produce a fairly strong attraction between the layers, although they can still be separated readily. This class of material is known as mica; an example is muscovite, NaAl3Si30i0(0H)2. In other structures with lower charges on the layers, the interlayer cations hold the layers together more weakly; the ions themselves may retain their hydration sheaths, and there are water molecules between the layers. This is the case for mont-morillonite (Figure 12-6). Because the water molecules between the layers can be removed or added easily, such clays show marked changes in volume upon wetting or drying. These clays are referred to generally as smectites. FIGURE 12-5 The structure of kaolinite. This is based on a two-dimensional layered structure of Si04 units (Figure 12-lg) perpendicular to the page; only three oxygens are shown around each Si for clarity. 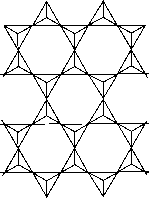 The geometric arrangement is shown schematically on the left. FIGURE 12-6 The structure of montmorillonite. The silicate sheet structure similar to Figure 12-lg is perpendicular to the page; for clarity only three oxygens are shown around each Si. The geometric arrangement is shown schematically on the left. Some soils, particularly in the tropics, contain colloidal metal hydroxides such as Al(OH)3 and FeO(OH) that are also referred to as clays and have similar properties. The structure of the aluminum hydroxide particles is based on Al3+ ions occupying the octahedral holes between two close-packed layers of OH~ ions, similar to the aluminum layer in the silicate clays described earlier. The layers are held together by van der Waals forces. Clays are capable of entering into ion exchange reactions in two ways. First, H+ ions can be lost from the OH groups, and replaced by other cations (which may later be exchanged for still other cations). This activity is pH dependent. Second, interlayer cations may be exchanged. Ion exchange is discussed in more detail in Section 9.7. The colloidal-sized clay particles can pack together to give a low-porosity soil that has low permeability; that is, water has considerable difficulty flowing through it. A layer of clay can be quite effective in preventing the passage of groundwater, with the possibility of protecting a deep aquifer from contamination by polluted surface water, but also preventing its recharge. Impermeable clay layers are an important feature of a well-designed landfill (see Section 16.2), being used both as a cap to keep water out and as a liner to restrict contaminated leach water, which may enter the fill through imperfections in the cap, from seeping into the groundwater. Hydrated metal oxide clays of Fe and Al that dominate some tropical soils and are also present in colloidal form in other soils have ion exchange properties similar to, but weaker than, those of the aluminosilicates. They tend not to be as sticky and adherent as the silicates, and soils with high proportions of hydrous oxide clays can be cultivated under moisture conditions that make siliceous clays unworkable. They can become concretelike when dry, however. Every soil is assigned to one of a variety of classes. Although the details of soil classification are beyond the scope of this book, Table 12-4 gives some of their characteristics. Entisols No horizon formation, little organic matter; includes sandy areas, thin soils on rock, recently produced soil deposits. Mostly used as grazing land in dry areas; can be productive in humid areas. Have been called lithosols and regosols. India, Australia, Sudan; very difficult to farm. Have been called grumusols. Inceptisols Young soils without much weathering. Aridsols Found in arid regions, they have had little leaching. Upper layers tend to be neutral or basic; lower levels contain calcium carbonate and often soluble salts. Many deserts are of this type; with irrigation, they can be very productive. Spodosols Temperate region soils from humid, forested areas; they are highly weathered and leached. Found in large areas in northeastern North America, northern Europe, and Siberia. Productive if fertilized.